The city is one of many contrasts that offers everything from world-class art festivals to fine dining, rowdy pubs, designer shops, comedians, luxury hotels, and hip coffee shops. 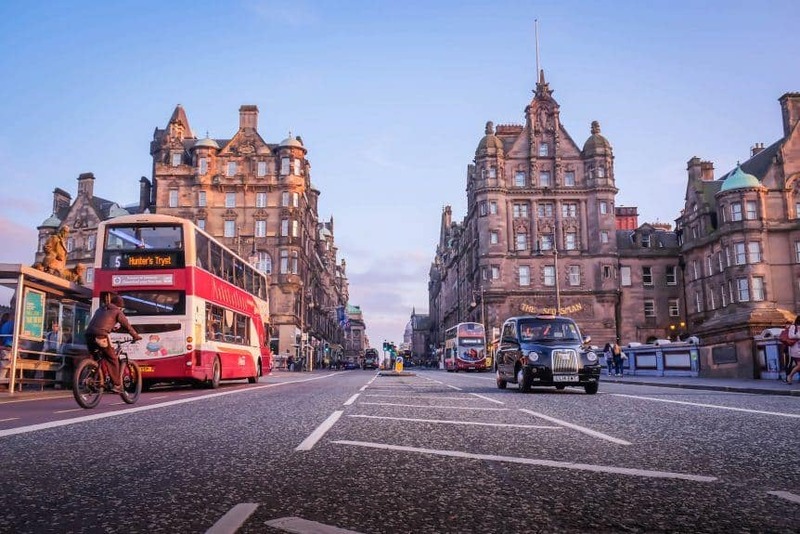 It’s almost impossible for any visitor to have the same experience or opinion of Edinburgh. We tried our best to enjoy a bit of it all, but like all visitors, we’ll definitely have to return someday with more time. We break down our favorite things to do here from tourist staples, shops, coffee shops, bars, and historical monuments. 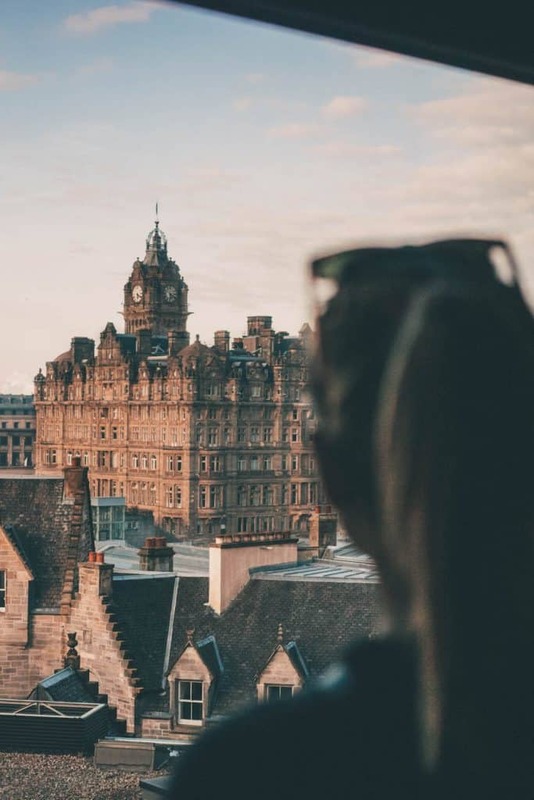 This is what we loved in Edinburgh and what we suggest for a good intro to Scotland’s capital city. What we love about Edinburgh is that it is compact and walkable. The city center is packed with shops, sights, restaurants, and history all within walking distance so there is no need to use public transport when exploring the city. 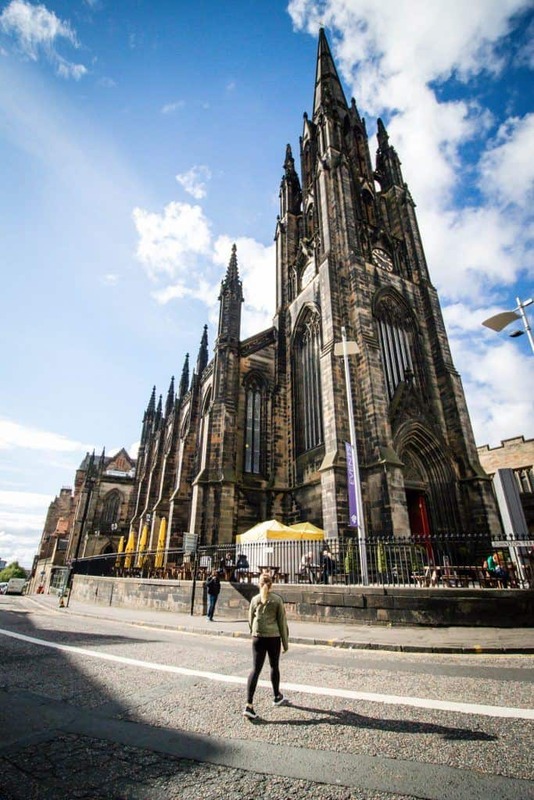 Instead hit the pavement and go explore the nooks and crannies of Edinburgh up close. If you’re looking for the best view of Edinburgh then head up to Calton Hill. 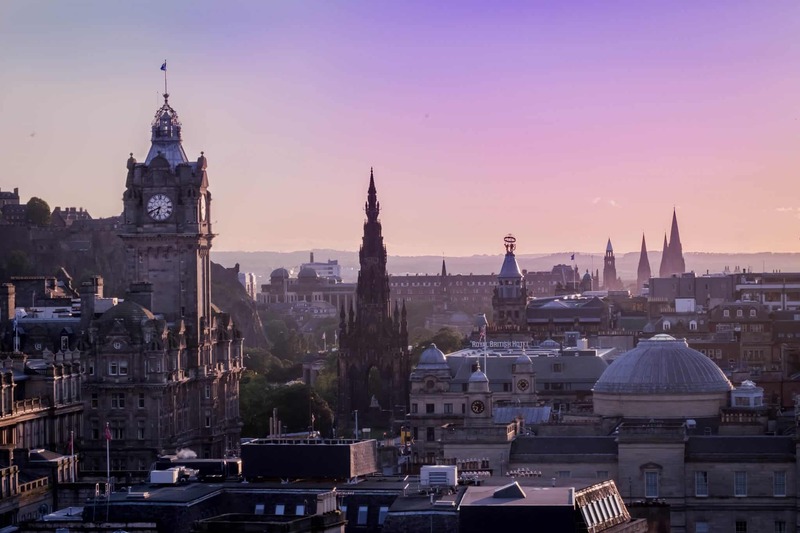 The small monument is an iconic staple of Edinburgh’s skyline and can be seen throughout the city. The hill may be smaller than Arthur’s Seat, but it’s centrally located and only a five minute walk up. This makes for an intimate viewpoint that is easy to reach. If it’s a beautiful day, our suggestion is to watch the sunset on the city from up here. The National Gallery of Scotland has one of the best collections of artwork in the city. We’re big fans of art and the galleries house all forms of work spanning over millennia. While it’s easy to make a jest of modern works of abstract art, the expression and freedom of art in the modern era is something to be celebrated. 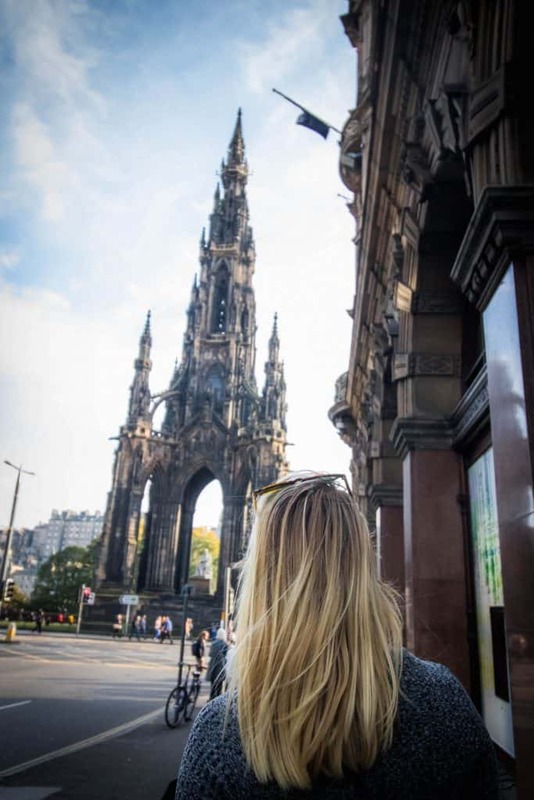 If there was one sight in Edinburgh that we had to visit it was the Scott Monument. The monument to author Sir Walter Scott makes a cameo in Tasha’s favorite movie, Cloud Atlas. We think it’s one of the best movies in the last decade and the monument is a pivotal setting in the film. The 287 steps to the top of the monument are another great place to take in views of the city. 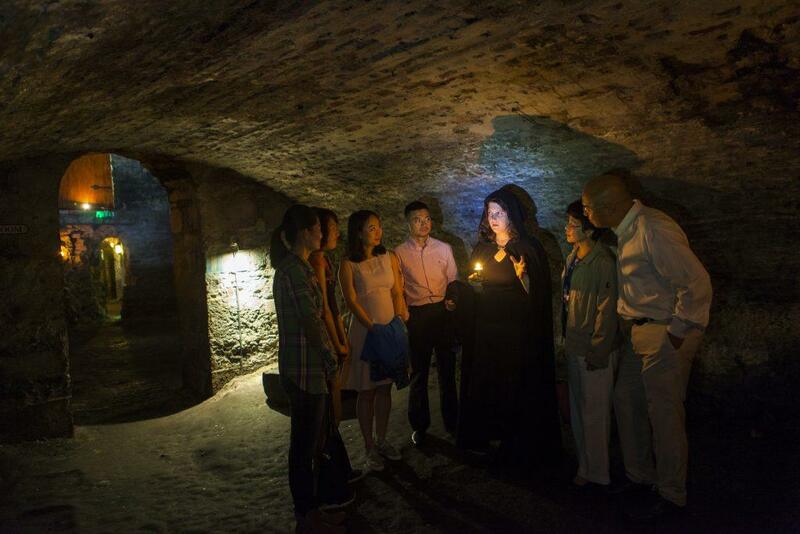 Edinburgh is packed with a long and bloody history so there is hardly a better place in the world to go on a spooky ghost tour. Your tour guide meets you at the Mercat Cross before taking you on a journey into Edinburgh brutal and historic past. The tour even descends into the underground and you’ll feel the chills roll down your spine as you hear stories about the residents who still remain. 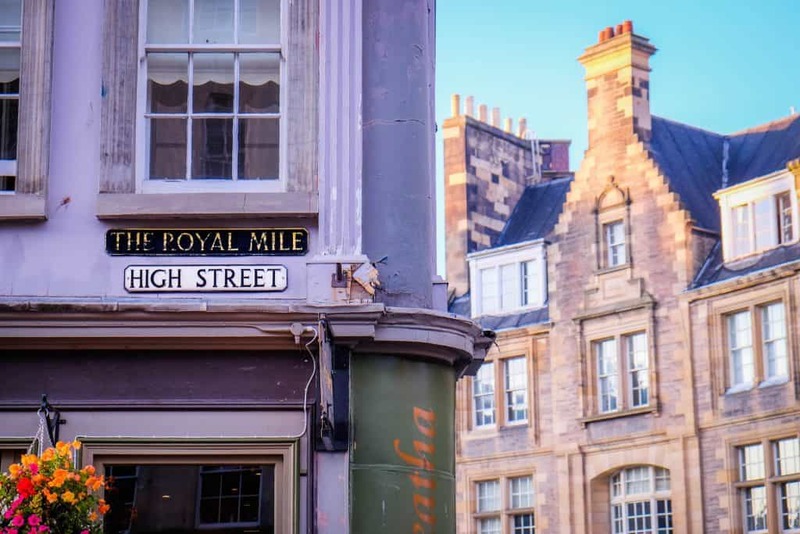 The aptly named Royal Mile is a mile long street that cuts through the center of the old town and ends at the Edinburgh Castle. It’s more or less the tourist thoroughfare. It’s always buzzing with people and buskers as it’s lined with pubs, overpriced gift shops, and restaurants. 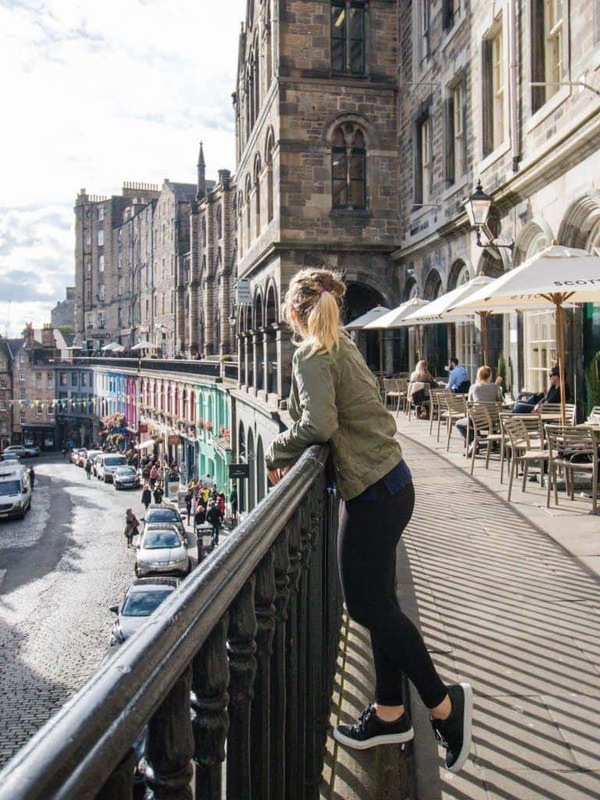 The cobblestoned street is home to a number of other things to do in Edinburgh and we often found ourselves walking along the street throughout the day. This large public park to the South of the city is the perfect place to have a picnic. We spent a few hours here relaxing one afternoon and found it filled mostly with local Scotts walking their dogs, playing football, or going for a run. This is a classic cinema and the perfect way to spend an evening in Edinburgh. It’s been referred to as one of the best cinemas in the world to catch a flick and is the oldest cinema in Edinburgh. They show a mix of blockbuster, indie releases, and classics. Check out what’s on the big screen here! This bar and restaurant has to be seen! Although meals and drinks here fetch a high price the interior is decadent and amazing. It’s been open for over two decades now and is now considered an institution in the city often filled locals and tourists alike. The stunning domed ceiling in the Grill Room with a large circular bar is sure to wow anyone. The Traverse Theatre is known for putting on some of the best shows in Scotland. It has bestowed upon itself the title of “Scotland’s New Writing Theatre,” and is the place to go if you’re looking to a new play. Within the theatre, you should also check out Dine for drinks and dinner. They serve up some innovative cocktails that rotate with the seasons and serve a wonderful a pre-theatre set meal that doesn’t break the bank. This waterfront suburb is a hit with locals. It has a number of cute cafes with outdoor seating and a number of restaurants, including a Michelin starred fine dining restaurant. It’s also the home of the Royal ship, Britannia. The floating palace is still owned by the Royal family and it’s a popular tourist attraction. However, after visiting the Castle of Mey on the North Coast 500 we decided to give it a skip. First off its “Whisky”, not whiskey. The difference in spelling was invented by the Irish in a bid to differentiate themselves from Scotch when selling to the American market. There are a wealth of bars, shops, and tours that specialize in the famed Scottish drink. We stuck to the cocktail bars in Edinburgh, but did manage to sample Balblair, Dalmore, The Singleton, Talisker Storm, and Lagavulin. Our picks? I personally love the smokiness of peat from Islay whiskys and would choose the Lagavulin (rejoice Parks & Rec fans! ), while Natasha would go with a 15 year Dalmore from the renowned distiller. 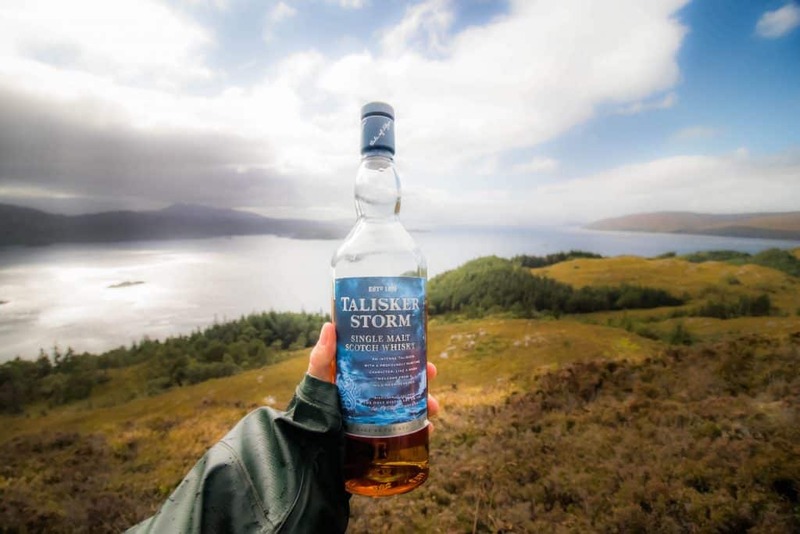 Another great whisky is Talisker Storm from the Isle of Skye. Historically, this square pedestrian area was the cattle market and where public executions regularly took place. The area is now filled with a number of pubs, hotels, restaurants, and shops. Including one of the best vintage shops, we found in the city, W Armstrong & Son. Harry Potter fans rejoice because Edinburgh has plenty of things to keep you entertained. The most important is Elephant House Cafe where J.K. Rowling penned much of the first book. Visitors have turned the cafe into an attraction with Harry Potter paraphernalia. Truthfully, there are much better cafes and restaurants in Edinburgh, but for Potter fans, it’s a can’t miss! This lovely park is the calm in the middle of a busy city. At one point it was even a Loch where most of the cities water and sewage came and went. Now, it’s been drained for over a century and serves as a lovely place to relax or enjoy any of the cities many festivals or their famed Christmas market. 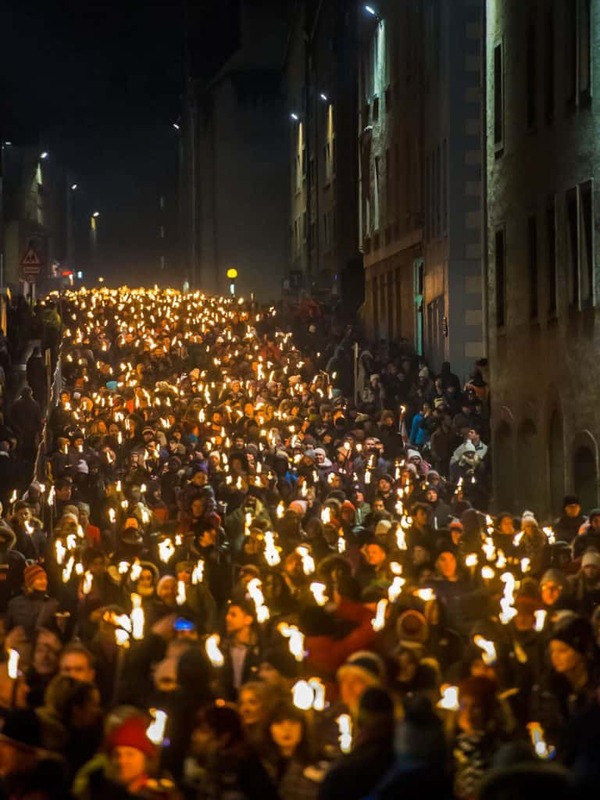 Edinburgh hosts a slew of world-class festivals year round. It’s likely everyone has heard of their most famous, The Fringe, which is considered the largest art festival in the world. However, there is a lot more to the city than that! 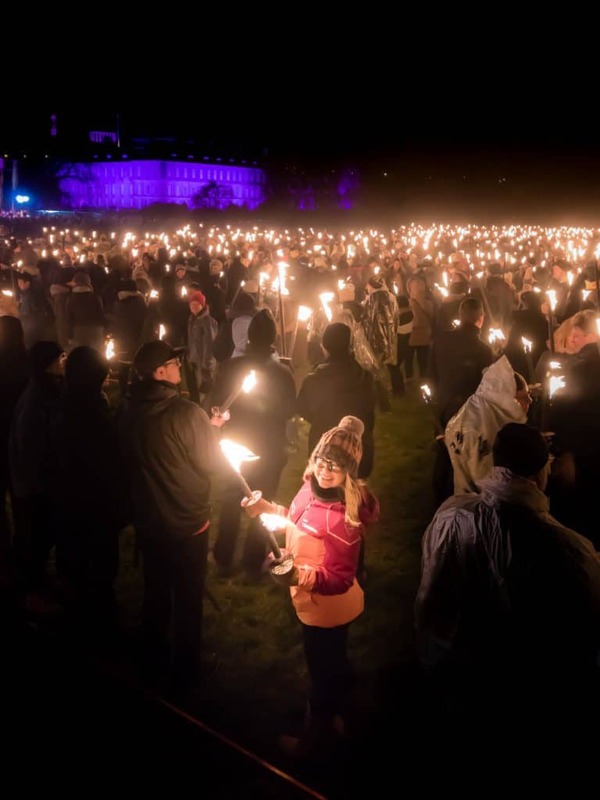 We were lucky enough to ring in the New Year at Edinburgh’s Hogmanay and it was easily one of our best New Year’s Eve celebrations to date. The last day of the year is referred to Hogmanay in Gaelic. 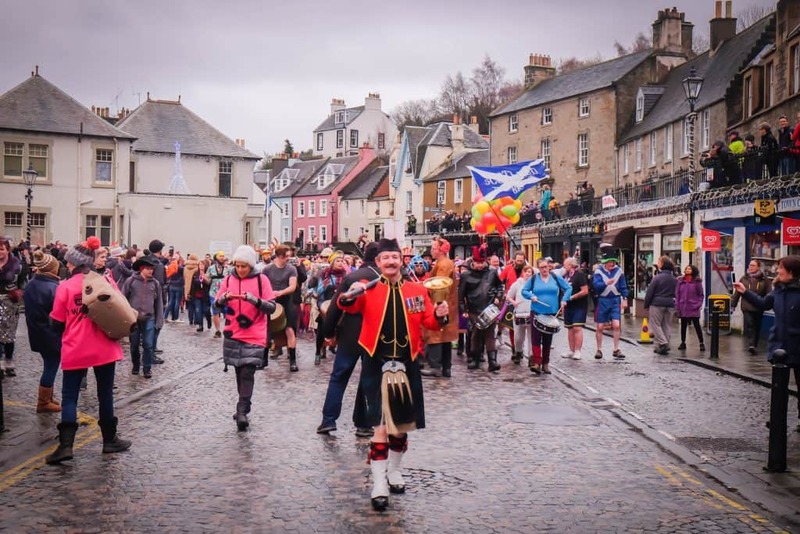 Every year people from around the world and Scots gather together in Edinburgh to ring in the New Year at an impressive festival. 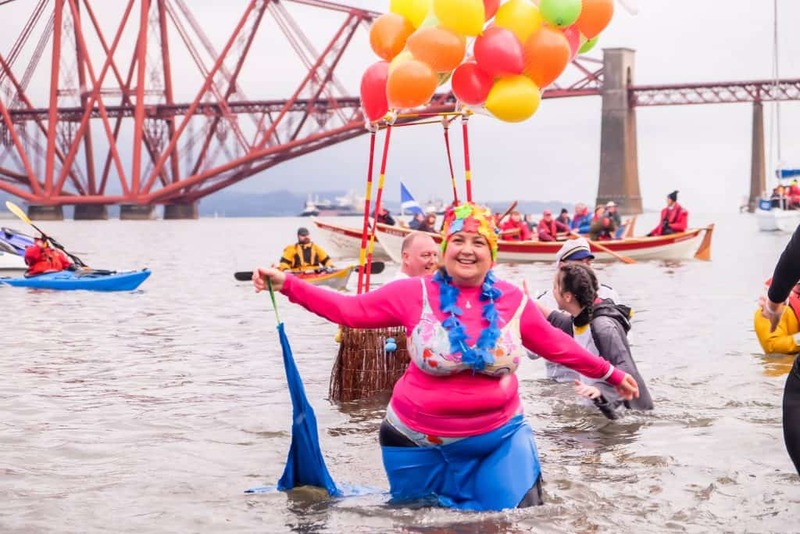 It’s a three-day celebration and involves concerts, fireworks, street parties, torchlight procession, and a dip in the freezing cold Firth of Forth at the Loony Dook. If you’re looking to hear the famous Scottish instrument you won’t have to look hard. There are performers all over the city offering visitors a chance to listen to them blow. We found they tend to jockey for several spots in the city considered to be the best. 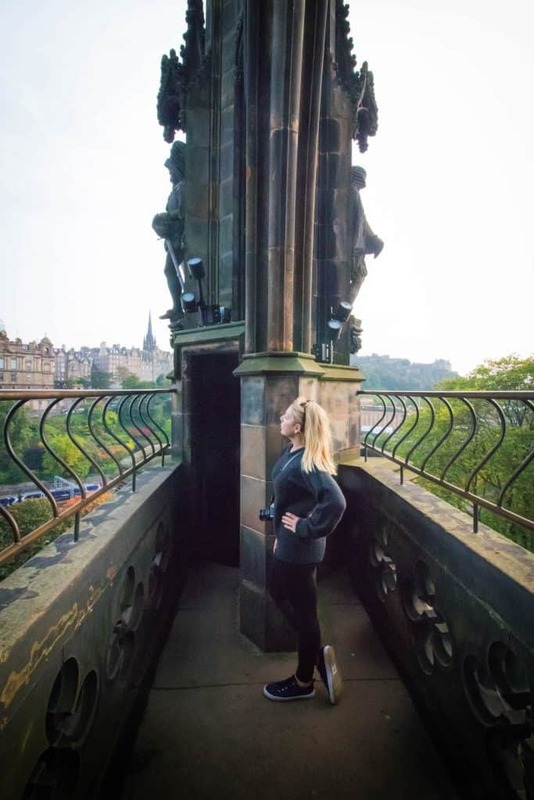 Two of the best spots to find them are at the end of the Royal Mile in front of Camera Obscura and between the Scottish National Gallery and The Royal Scottish Academy. 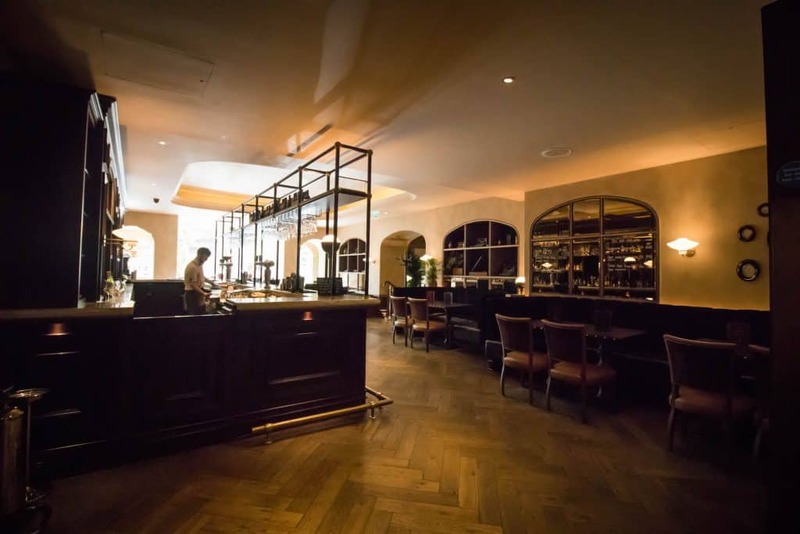 The bar and restaurant are a part of The Principal Hotel On George Street and deliver on the atmosphere. They serve up some of the best cocktails in the city and the hip bar is was buzzing on a Friday night. It tends to pack in an older and hipper crowd as cocktails are around 10 GBP. This charming seaside town makes for a great escape from the city. 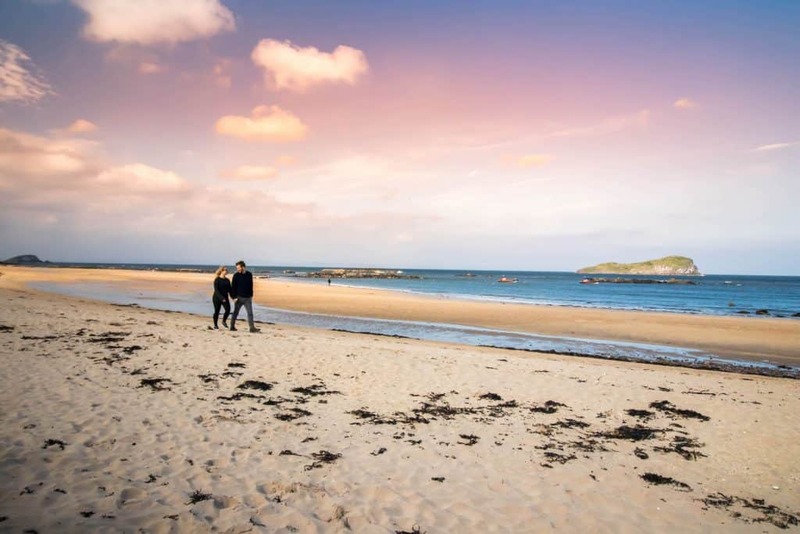 It’s really easy to hit multiple destinations outside the city with Scotrail. It’s about a 30 minute train ride away from Edinburgh Waverly and is a nice break from the hustle and bustle of the city. 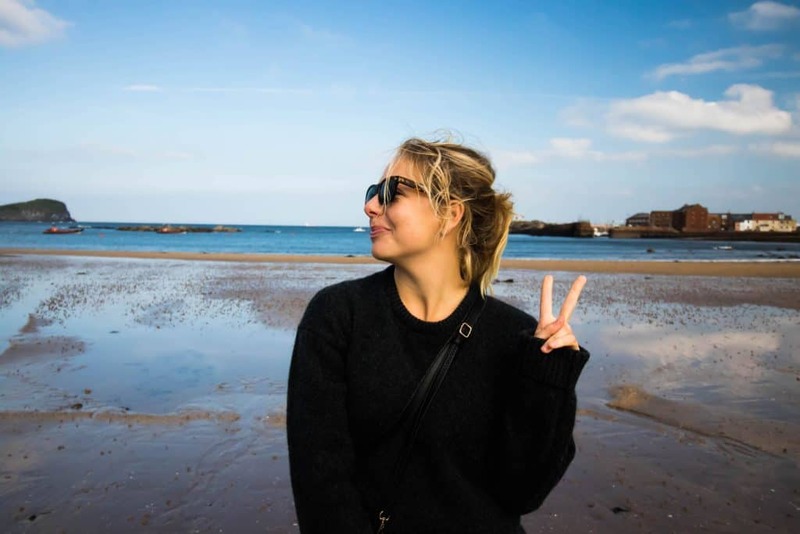 Our day in North turned out to be one of our favorite days in Scotland, and all we did was walk around the beach and enjoy the sound of the seagulls. The town has a number of lovely shops, restaurants, and a wonderful cafe where we enjoyed a tasty brunch. 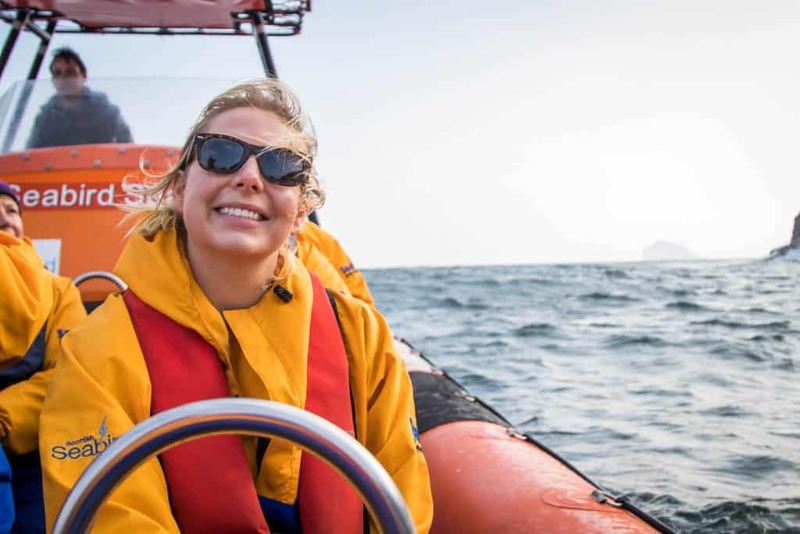 The center helps manage a number of habitats along the Scottish coast, one them being Bass Rock. It is home to one of the largest bird colonies in the world. In all our time in Scotland, it was one of the most incredible things we have seen. 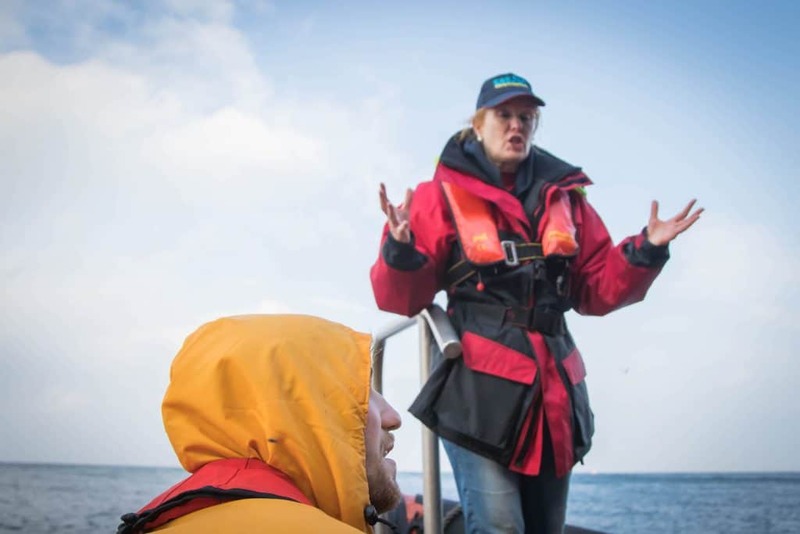 The island rises out of the sea in dramatic cliffs that are home to nearly 150,000 gannet birds. Sir David Attenborough has named it one of the greatest wildlife spectacles in the world. We may not have as much experience as him, but we’ve had some amazing wildlife experiences already. And now, a video of Edinburgh for you!